Our first monthly program of 2016 was opened by Debbie Thomas, President at 7:00 p.m. sharp. New guests and returning members were warmly welcomed along with the introduction of our 2016 Board of Directors & Executive. Guest Steven Gaundor from the Fair Board gave a brief update and invited continued support from DHS as in the past. Three areas for improvement included: starting on time, reducing noise in the hall, and more parking. Starting time: doors open at 6:30 pm; a short video will be shown at 6:50pm to announce beginning time; late registration/ways and means will continue at break time. Changed layout will eliminate congestion at the back of hall upon arrival. Noise: the food table will remain out the entire meeting to eliminate noise in the kitchen with prep and clean up. Parking: off Lock Street, across from Hart Funeral Home, and in lot which backs onto Optimist parking lot. Moving ahead, we will endeavour to shorten the business portion of our monthly program with the Treasurer’s Report and Minutes posted on our bulletin board as well as on our website. Although Fall Seed Exchange is typically done in February it was decided to stay with fall amongst our own members. Our Four Seasons Garden Photo contest will continue but photos must be of gardens. Comments and suggestions are welcome throughout the year with a book at the back of the hall for additional comments at any time. A monthly SACHEM gardening column will be written by Sandi Marr announcing upcoming DHS programs and encouraging new guests to attend. Our 2016 brochure was highlighted with a few changes of dates such as the Annual Plant Sale on May 14 and Christmas Planters Nov. 5. 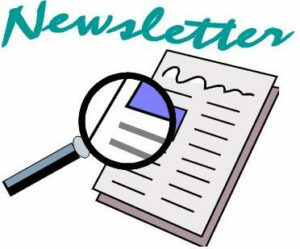 Be sure to check out our newsletter by Sue Mazi for more information and monthly updates. Everyone was encouraged to consider where they might enjoy volunteering such as Lions Home Show, Trillium Awards, Town Gardens, Jr. Gardeners (police check required to work with children), etc. A 15 minute break was taken with time to purchase 2016 memberships for the Early Bird draw at next month’s program. Fees will remain the same again this year: $10 for single and $15 for couple. Our goal is to reach 200 members to qualify us for a larger grant. Consider a membership for your spouse or someone living at the same residence. Delicious refreshments were provided by Marlene Link, Pauline Bradford, Denise Richardson, Helen Edl and Joan King. Sandi Marr introduced our Panel of Experts for “Master Gardener’s Q&A 2016: Marlene Link, Doris Thomson and Lester Fretz, host. The panel discussion and audience conversation was lively and most informative covering a broad range of topics: wintering over poinsettias, starting plants from seeds, organic farming, weed control, use of rain barrels, composting, use of manure, use of power tools such as rototillers, mulching with leaves, and pruning fruit trees. We are fortunate to have such a wealth of gardening knowledge and experience amongst our own group. Thanks to those who participated. Everyone was invited to return for our February 18 program with guest Theresa Forte (Canada Blooms speaker, photographer and journalist), “If you plant it, they will come: Birds, Butterflies, Bees. Meeting was adjourned at 8:40 p.m. with 49 people signed in. Ways & Means winners were called with thanks to Betty Ballanger and Gwen VanNatter for organizing these recycled treasures and everyone who donates. What do Gardeners do in January? Plants brighten our indoor spaces while we wait for spring to arrive. What do gardeners do in January? With the hustle and bustle of Christmas behind us, we begin a new year filled with hopes and dreams. Old Christmas trees can be recycled outdoors as a feeding station for birds by adding suet and other treats to their boughs. Greens may also be mulched for garden perennials. Remove spent flowers on amaryllis. Set the plant in a bright sunny window to allow the leaves to fully develop. Keep the soil evenly moist and fertilize occasionally. Choose sand, bird seed, sawdust or vermiculite to place on icy paths. Avoid salt or ice melters which may injure plants. Begin planning your summer gardens. Create a small map of your garden and use it as a guide for ordering plants and seeds from the catalogs soon arriving in the mail. Get your garden tools ready for spring. Sharpen and oil tools such as shovels, shears, and mowers. Power tools such as weed eaters and power mowers may benefit from a good tune-up. Care for your clay pots. Clean them by soaking them overnight in a solution consisting of one gallon water and one cup of white vinegar. Sanitize with a solution of water and household bleach. Don’t forget about caring for your houseplants. Clean them with a damp cloth or a quick shower under the tap. Dust on the foliage can clog the leaf pores. Always use room temperature water and fertilize with a solution of half strength plant fertilizer. Provide sufficient humidity by setting plants on a tray filled with moistened, clean pebbles, or by simply setting a cup of water nearby. Fireplace ashes can be saved as a fertilizer for your iris, roses, and lilacs in spring. Do not apply to acid-loving plants. Excess ashes may also be sprinkled on your lawn. Finally, if you aren’t already one of the over 200 members of the Dunnville Horticultural Society (DHS) from 2015, consider coming out to a monthly meeting and better yet, joining. You will find us to be a friendly group of novice and experienced gardeners. We gather at the Dunnville Optimist Hall every third Thursday of the month 7-9 p.m. We are a group of gardeners from 5 years to 85 years of age and all life stages. 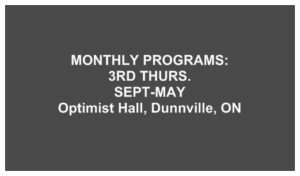 Our monthly programs include a motivating speaker, updates on what DHS is up to in Dunnville, repurposed door “prizes” and best of all, yummy snacks. On the agenda for January 21 is a Question and Answer time with our own master gardeners: Marlene Link, Beth Powell, Doris Thompson and Lester “MacGyver” Fretz. Sandi Marr, DHS Reporting Secretary. Sandi welcomes your questions and ideas for future gardening columns. Happy New Year! I hope your holidays were everything you hoped they could be. It’s a nice time to reflect on the past year and look forward to the new one. It’s nice to have a break from gardening but if you’re anything like me you can’t wait for spring to see what your garden is going to do. Perennial gardens are always a work in progress and they’re never the same two years in a row. Your 2016 executive was sworn in at the November general meeting and everyone is working very hard planning and organizing our meetings and events. First thing is that we are no longer going to call our meetings “meetings”. They are going to be called “programs”. We will keep the business to a minimum and concentrate more on our guest speakers, Ways and Means and of course the goodies. Our first monthly program is rapidly approaching and we are going to have a question and answer session with 4 of our very own master gardeners. Where better than our own membership can we turn to find experts? Appearing will be Lester Fretz, Marlene Link, Beth Powell, and Doris Thomson. They each have different areas of expertise so bring your gardening questions. Last year proved to be very informative and a lot of fun. Don’t miss it! And remember: our doors open at 6:30 p.m. and programs start at 7:00 p.m. sharp. Survey says! Membership fees are going to remain the same as last year. A single membership for 2016 is $10.00 plus $5.00 for each additional person at the same address. Considering all that our society offers (monthly speakers, bus trips, plant sale, flower shows, seed exchange and of course our world famous Christmas celebration) where else could you better spend $10? Okay, our Christmas celebration may not be world famous, but word has definitely gotten out: we had over 100 people in attendance. In fact we had over 100 people at a few of our meetings this year. The main purpose of the DHS is to beautify the flower beds in town but our second is to educate, socialize and have fun and it looks like we’re doing something right! Our membership has grown to 206 which includes 3 life members. This is totally awesome! Many of the garden centres in the area offer discounts to DHS members so be sure to inquire if you’re out shopping for plants in the spring. Speaking of memberships, be sure to purchase yours no later than the February meeting in order to qualify for a chance to win our annual Early Bird draw. I hope everyone got a chance to see our light up display at Wingfield Park. I don’t mean to sound biased, but Marilyn Stavinga’s winning design turned into the most beautiful display of all! Thank you to everyone who helped bring this project to fruition. It was also placed in the appropriate spot–right behind the Wingfield monument. W.H. Wingfield was the very first president of the DHS back in 1929. I do believe he would be very proud of what we have accomplished. Our website has been updated for 2016. 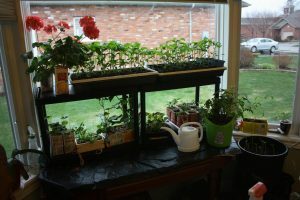 There is a plethora of information here so be sure to visit dunnvillehortsoc.gardenontario.org. Not only is there a very interesting history of the DHS on the site as well as a list of all past executive, there is information on all aspects of gardening and many links to other websites that we think will be of interest to you. The dates for all of our events and programs are listed with the names of our confirmed guest speakers. We will have printed calendars at the upcoming meeting, and the calendar can also be viewed on our website. Our guest speaker for February is Theresa Forte from Canada Blooms. Her topic will be “If you plant it, they will come: bees, butterflies and birds”. Starting in January the DHS is contributing a monthly column in the Sachem, our local paper. Our recording secretary, Sandi Marr, will be submitting this article and with her experience and knowledge it will be very interesting and informative. If you don’t get the Sachem you can find these articles on our website. Our DHS Junior Gardeners program went very well in 2015 and the kids did a great job! We hope to grow and expand the program for 2016. Thank you to Judy Jeffery and Marg and Mark Bottrell, and Pauline Bradford for working with the juniors. If you or anyone that you know would like to volunteer please let one of them know. All volunteers mentoring the children must have a vulnerable sector check done. The junior program runs throughout the summer. This year we’ll be changing up the flower and veggie show. We’ll have two shows this year, June and October, along with our pumpkin carvings and designs. It never ceases to amaze me how creative our members can be. We’ll be taking part again in the Dunnville Lions’ Home and Garden show in April. Our membership drive at last year’s was a huge success for us, and I’m sure this one will be too. The plant sale in May of course is on again, only this year we will be holding it the week after Mother’s Day on May 14th. Mother’s Day weekend is just a little too early this year. Please plan on donating plants for the cause if you are dividing anything in the spring. This is our largest fundraiser each year and all donations are welcome. Each year we have a huge variety of perennials and annuals and there’s something for everyone. We are hoping to have the Junior Gardeners enter a float in the Dunnville Mudcat parade in June. Everyone in town looks forward to the parade and it’s a great way to publicize our society. We will be planting the town flowerbeds on Saturday, May 28th. Mark your calendar and please plan to help out. Our army of volunteers has done such an amazing job each year and I know this year will be no exception. We have been asked to let our members know about a new internet program called HortusTV. It’s a video streaming program that has over 300 episodes of garden shows from around the world, free of advertising. Some are vintage and some are brand new, with new ones being added all the time. It has just launched in Canada. There is a 7 day free trial with no obligation if you want to check it out. After that, if you like what you see, you can subscribe for $6.99 per month plus applicable taxes. It’s sort of like Netflix. Go to www.hortustv.com to sign up for the trial. Credit card is not required. Your president, Debbie Thomas, is going to check it out and hopefully let us know if there are any pitfalls. It certainly sounds interesting. If any of you try it please give us some feedback. I think I’ve covered everything for now. The Dunnville Horticultural Society held its first meeting of 2016 on January 21st, highlighting their events calendar for the year ahead. The DHS would like everyone to know that their monthly meetings, held on the third Thursday of the month, are a complete program, with informative speakers, refreshments, draws and socializing. The programs are open to everyone. A membership is not a requirement to attend, but memberships enable the DHS to fund and complete new projects each year. As a member you receive discounts at participating garden centres and growers, and advance notice by email of private garden tours, workshops and bus trips. You also have opportunities to mentor youth in our Jr Gardeners program, swap plants, cuttings and seeds, and take part in members-only free draws. Monthly programs begin at 7pm, doors open at 6:30pm at the Dunnville Optimist Hall, located on the corner of Main St and Cedar St. Our next program is Thursday Feb 18th, with guest speaker Theresa Forte (a past Canada Blooms speaker). Her topic, if you plant it, they will come: Birds, Bees, Butterflies. President Debbie Thomas would like to invite you to attend the upcoming monthly program to get acquainted with a very dedicated & friendly group of volunteers that make Dunnville Bloom. A green thumb is not required. For information contact DHS President Debbie Thomas at (905) 774-3064.